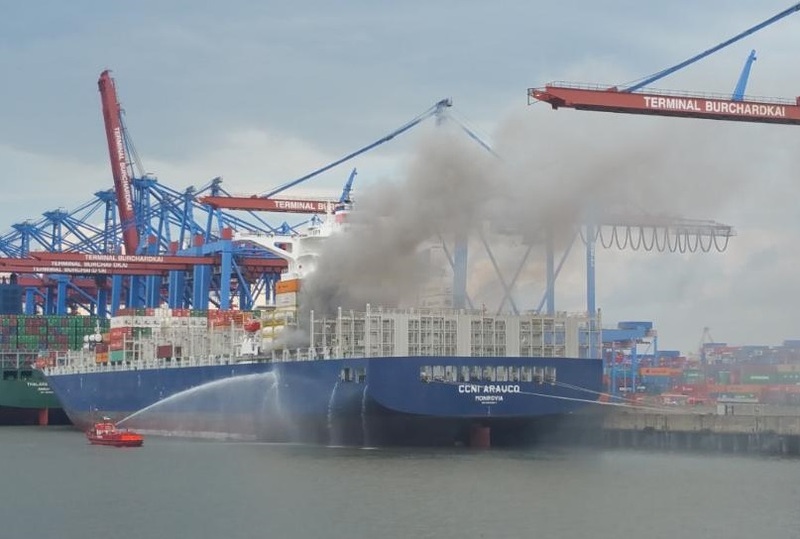 The mega container ship CCNI Arauco caught fire after explosion in container at the dock in Hamburg, Burchardkai. One of the container in aft part exploded during welding work over it, which caused fire and flames extended to the nearby units. The thick smoke covered the vessel and container terminal in Hamburg. The crew started firefighting, but was unable to extinguish the flames and requested assistance from the local authorities. At the scene of the accident were dispatched more than 150 firefighters and several machines, which are trying to get control over the flames. Fighting boats and tugs are pumping water and attack the flames from the Elbe. The crew from the mega container ship CCNI Arauco was evacuated and police cordoned the terminal. On board of the vessel there are no declared hazardous cargo. 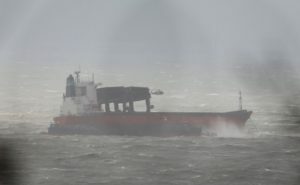 “The flames are over 800 degrees and could tear container ship”, said the local Fire Department in official statement. “There is no danger for the population in vicinity. Residents should keep windows and doors closed yet up to the area Blankenese”, adds the statement. The mega container ship CCNI Arauco (IMO: 9683843) has overall length of 300.00 m, moulded beam of 49.00 m and maximum draft of 11.90 m. The deadweight of the vessel is 112,588 DWT and the gross tonnage is 95,138. The ship has maximum capacity for 9000 TEU. The ship was built in 2015 by Hanjin Subic Shipyard in Philippines. The owner of the mega container ship is NSC Holding and the operator is CCNI. Require News about Maritime movement..